Once a year my friends host an outdoor movie night. They hook up a PA system, rent a projector, spread a sheet across the side of the house and shine a movie on it. We roast marshmallows and hot dogs while gathering around with blankets and lawn chairs. At the end of the evening everyone tells them that they should do it more often. My friends nod and agree, but outdoor movie night continues to be only once a year. I know exactly why. Hanging a sheet on the side of the house, running wires from the living room where the entertainment center is, and hooking up a PA system so everyone can hear involves a lot of setting up and tearing down. 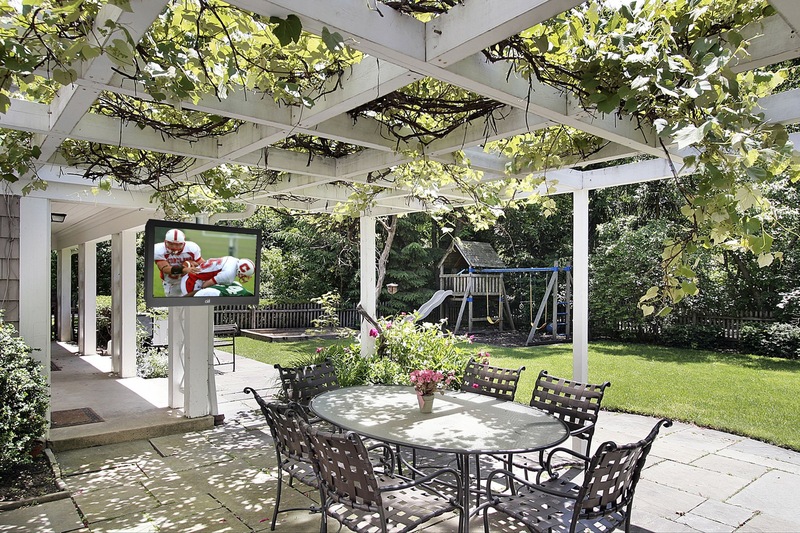 But what if someone could install a permanent outdoor entertainment solution for them? Projectors are great for movies, but so are flat panel TV’s. Ciil (pronounced “seal”) patented a fully sealed, seamless television that withstands dirt, dust, ice, insects, or full submersion in water. Sensors built into the panel adjust the contrast level depending on the amount of sunlight, so the image never appears washed-out or dim. Ciil’s Dynamic Thermal Transfer System regulates the temperature of the set to withstand a Denver climate without the use of noisy fans. Landscape Series outdoor speakers by James Loudspeaker surround family and friends with sound, while remaining virtually invisible. They designed a subwoofer that installs 75% underground, while their speakers resemble and blend in with existing landscape lighting. And nothing completes a system like integrated lighting. Whether you’re controlling everything with a remote or just your iPad, outdoor lights should respond to your fingertips. Press a single button, and a trail of lights Illuminate a path to the kitchen for any last minute snack runs. When considering an outdoor entertainment system the best place for anyone to start is an experienced integrator like CDI Services. They excel at designing systems for existing environments that compliment the surroundings, operate intuitively, and captivate viewers with high-performance functionality.